The story of this Memorial is included in our National Mall Tour. Listen to a preview here and download this stop by itself or as part of the full tour! Did you know that the most influential man in American history had just 18 months of formal education? As a child, Abraham Lincoln was known to walk several miles just to borrow a book. Honest Abe: the man who kept the Union from falling apart; the man who freed the slaves; the man who gave the ultimate sacrifice for his country. The story of Abraham Lincoln and his rise from poor uneducated farm-boy to the great man he became is not just the story of one man; it is the quintessential story of the American Dream. Without him, the United States of America may not exist today. The Abraham Lincoln Memorial in Washington DC is located at the farthest western point of the National Mall, near the shore of the Potomac River. Standing on its steps, one can see all the way to the Capitol Building. If there is any spot in Washington DC that truly represents American ideals and gives a spectacular view in every direction, this is it. 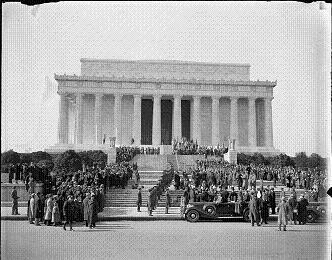 Hear the history of the man and his memorial on our National Mall Tour.